Boxing quotes of 2018 part one: Who said what, about who, and when? Eddie Hearn and David Higgins' verbal battle began. Who won the opening round? "We need to agree on a fight this year because I don't know if I will be boxing into next year, if I am honest. I really do mean it. I am not getting any younger." Kell Brook began the year as he will end it... not getting any younger. "He just seems like a big bully and I don't like bullies. That was the moment I said to myself 'I would like to fight this guy one day', and ever since then he's been on my radar." Dillian Whyte told Lucas Browne to pick on someone his own size. And he did. "It will take more than a human to stop me." "I got a WhatsApp this week saying: 'Joshua is saying how you put him down'. I was sat in a gym, in Liverpool, doing a weights session. I messaged back saying: 'Well, he's had the last laugh, hasn't he?'." David Price admits Anthony Joshua has gone from strength to strength since their sparring session, back in 2012. "It all started for jokes and giggles, but he bit. I have a TV show called the 'Culinary Fighter'. I tagged him in one of my episodes because I called him a 'Khandashian'. I tagged him and he blocked me. I didn't think much of it. I'm like whatever." "I didn't agree with some of the judges' decisions in the first fight, this time there will be no doubt. I am leaving the ring as THE middleweight champion of the world." "In the build-up to this, it was east London versus south London, but I consider myself London. Right now in the cruiserweight division, I own London, now let's go for Britain." 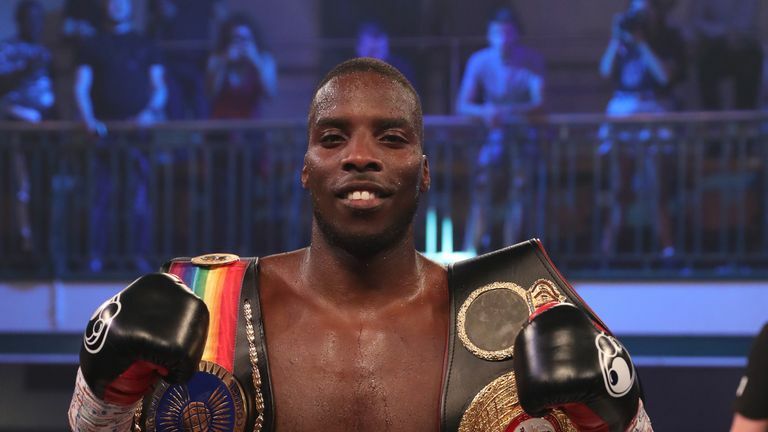 Lawrence Okolie won the British Beef battle with Isaac Chamberlain, without any real capital punishment required. "I think you would love to be me. You would love to be in my position, you would love to have the Instagram followers and the style. I think you are jealous, George. You are in big trouble my friend." Chris Eubank Jr claimed George Groves was envious of his popularity, but the WBA 'super' champion had the final word with a points victory in their World Boxing Super Series clash. "What happened last time to postpone the fight was a freak accident, like getting hit by a car, there's nothing you can do. Unfortunately, it happened and thankfully the rematch got rescheduled." David Haye was back in gear after three months' work rehabilitation, with all roads leading to Tony Bellew again. "If the people around Joshua really cared about him and loved him, I think someone should've tapped him on the shoulder and whispered in his ear to tell him he's got it all wrong. Everyone knows that Tyson Fury isn't the biggest threat in the heavyweight division. Everyone knows who is the man in the heavyweight division, hands down." Hands up if you thought it was Deontay Wilder? The Bronze Bomber did, as two world champions were preparing to defend their titles and the former unified champion was cleared to climb back in the ring again. "Unifying the lightweight division was a goal of mine from day one in the pros and I want to have all the belts by the end of the year." Katie Taylor began the year as the WBA lightweight champion but is still trying to reach her goal. "Even say this is a fight that you're willing to take but you don't want it right now. But after the fight? We'll see. I'll be like the rest of you, sitting there wondering if he's going to say my name." Deontay Wilder was told he couldn't be ringside for Anthony Joshua's fight with Joseph Parker. "Wilder, or Fury. Either one. What would I have to do to beat Wilder? Get him in the ring and I knock him spark out." Anthony Joshua obliged after adding the WBO crown to his growing collection. "As long as I keep winning, that's the plan. Joe Calzaghe was a world champion for so many years, having loads of defences, so along the way people bought into him. I'm from Cardiff and people will come out to support me - it's on their doorstep." "I got a bit of stick at home, people saying I was unprofessional, that I've not made the weight, but I am not unprofessional at all. I still apologise for doing that, I don't cut corners." Scott Quigg didn't tell those at home that he'd fractured his foot four weeks ahead of his loss to Oscar Valdez. "To get to be mentioned with Manny Pacquiao and Juan Manuel Marquez is a huge honour for me." "If he doesn't want to surrender his purse, he can jog on. Who wears cane rows at 37?" Derek Chisora wanted more than fringe benefits to get him in the ring with Joe Joyce, managed then by old friend David Haye. "I would rather look for those stadium fights instead of the world titles because I have won world titles in my career. I want to leave that legacy behind and fill out a stadium." Amir Khan was back on British soil and Kell Brook was back on his radar. Again. "I don't need to say much. Everyone is saying it for us. People who know a lot more about boxing were saying that ref allowed Anthony Joshua to execute a very disciplined, conservative fight plan, which did suit Joshua and did not suit Parker." "If I'd trained Conor, how Eubank trained his son, he'd just say 'No, it's time for you to go Dad!' and I would just say 'Don't worry son, I was already ready to go!'." "I am sure I am at 99 per cent of the spars and he has hit him flush and has probably shook him up a bit, but the way they make out that he put him down on his backside, it just never happened." Frazer Clarke shared his inside knowledge on the rumour that Daniel Dubois knocked 'AJ' out in the gym. "This time around every single facet of my game is better. You'll see a version of the Hayemaker that isn't 40." David Haye, 38, planned to turn back the clock against Tony Bellew. Having turned it forward in their first one. "It's always nice to call someone's bluff. What we've done is called their bluff here, and they won't even meet to talk about the deal. It's bizarre, but we are talking to other people as well. There's probably about 50 people trying to make this deal at the moment." Eddie Hearn proved that money doesn't talk, following the infamous $50m offer made for Anthony Joshua to fight Deontay Wilder. "I'm a walking Super Series - every fight I'm in is the Super Series! Usyk, Gassiev, Andre Ward? You name them, I keep beating them." "In my opinion, he should have never been in there anyway and he shouldn't even have been in there last year, but he was." Adam Booth beat his old charge to it and called for David Haye to finally walk away. "Going into this fight with Linares, we knew Loma was a huge talent, after this fight, we know now that he is a fighter." "To say I'm disappointed by this decision is an understatement. To not be given the chance to demonstrate my ability to the BBBoC through the standard assessment afforded to others is hard to take." Rio Ferdinand was used to the hairdryer from Sir Alex Ferguson, so let his own go after being denied a licence. "AJ is an excellent athlete and he's very good at going forwards and backwards in straight lines. I tell him to be confident and to try different moves, not to just bulldoze forwards." Tyson Fury was back in the ring as a changed man, happy to give the unified world champion some advice. "I am taking this very righteous step, I believe, to correct a wrong that occurred in our history and to honour a truly legendary boxing champion. It's my honour to do it. It's about time." President Donald Trump pardoned Jack Johnson's racially-charged conviction. "The IBF had to enforce the penalty under Rule 5H for Golovkin having participated in an unsanctioned contest within his weight class and declare the IBF Middleweight title vacant." Gennady Golovkin had only held the belt for two-and-a-half years. It was clearly too long. "He's blocked me on Instagram and everything. He blocked me on Twitter as well. He is upset." Derek Chisora's ongoing feud with Dillian Whyte spilled over onto social media. "You saw what I did in there. Now I want all the champions at welterweight." "He's a legend, isn't he? A city legend, so it would be class getting 'Big Al' to walk in with you. I don't know if he would do it, but it would be nice if he would." Lewis Ritson was heading to Newcastle in June and wanted one man and one man only, joining him. "Very, very, very good fight. If you ask who I'm backing, I'm going with Dillian, and I'm going by knockout as well." Anthony Joshua gave an instant prediction on Dillian Whyte's toughest assignment, Joseph Parker. "They will kick themselves forever unless they get it over the line. Fingers crossed - December. If they can both keep winning, we'll get there for Khan vs Brook." Eddie Hearn looked for an early Christmas present, as the silly season known as summer, began.